To Get the Look of Genuine Sapphire, Think Small. 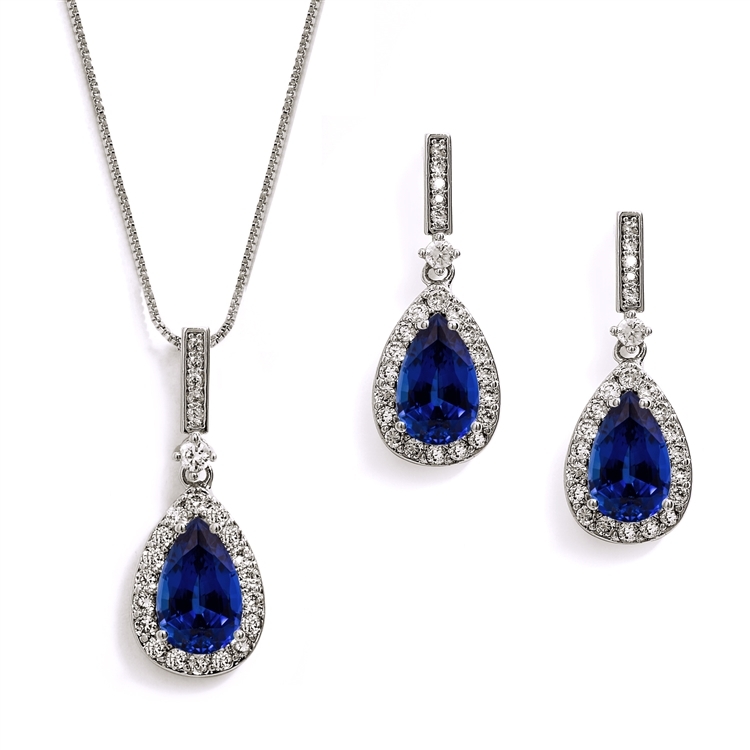 Thanks to the Delicate Size of our Pendant Necklace and Matching Earrings, Your Admirers Will Be Convinced You're Wearing Real Blue Sapphire Jewelry! Perfect Something Blue Wedding Gift or September Birthstone Present. Good things come in small packages and this top selling Mariell necklace and earrings set is no exception. With brilliant AAAAA quality Sapphire Blue Cubic Zirconia plated in Genuine Silver Platinum, the round halo solitaires and matching pendant have the look of fine jewelry at a fraction of the cost. Sleek modern styling, understated glamour and a dainty silhouette define this bridal favorite. With its luxurious gemstone-like elegance, our glistening royal blue set makes a fabulous gift for bridesmaids, holidays, birthdays and anniversaries. It's perfect for prom, homecoming, mothers of the bride and any special occasion gown. Despite its dainty size, this versatile "must-have" colored CZ set packs some serious sparkle. We love how this Zirconium beauty will not only adorn your formal frocks but will glisten with a business suit or jeans and a Tee. Basically, this necklace and earrings set is the "little black dress" of jewelry. For everyday wear, we love the drop earrings or pendant necklace worn alone to really give the look of fine jewelry. No one but you will know these aren't priceless gems! Our delicate CZ Pave framed pendant measures 1 ⅛" high and features a pronged pear-\shaped navy blue cubic zirconia gemstone. The pendant is on a luxurious box-chain (adjustable 16" - 18"). Each of the matching drop earrings also measure 1 ⅛" high and come with posts and comfort disk backs. Treat yourself or someone you love to classic "Breakfast At TIffany's" glamour. Lifetime Guaranteed. We promise you'll love this "Something Blue" best-seller or your money-back. It's a perfect jewelry set for September Birthstone gifts.